VANCOUVER, BRITISH COLUMBIA--(Marketwire - May 14, 2008) - Amarillo Gold Corp. (TSX VENTURE:AGC) ("Amarillo" or the "Company"), is pleased to report on gold assay results from the first 4 holes of a 5 hole step-out section being drilled on its Butia prospect at its Lavras do Sul project in southern Brazil. Extensive intersections of higher grade gold mineralization were reported in all holes. - Drill hole LDH-122 included 206 metres averaging 2.16 grams per tonne (g/t) Au from 73 metres and 29 metres @ 4.92 g/t Au from 107m. - Drill hole LDH-123 intersected 227 metres averaging 1.84 g/t Au from 80 to 307 metres, including 22 metres @ 8.26 g/t Au from 147m. The comprehensive gold assay results for drill holes LDH-122 through to LDH-125 are summarized using a 0.3g/t cutoff grade in table 1 below. A further 3,000 metres of drilling is projected for the current program with the two objectives of defining the extent of mineralization of the Butia deposit and to acquire enough data to commission an independent 43-101 resource assessment of this prospect. The above four drill holes were drilled on-section, collared approximately 50m apart, and were completed in the centre of a partly outcropping syenite zone. This syenite had been specifically targeted by the Company's geologists as a favourable host for higher grade gold mineralization and it appears, based on these results, that they have found the key to higher grades at Butia. Although this prospect had been drilled previously in the 1980's, these older holes were drilled over the top of the higher grade gold zone reported on here. All holes, save for LDH-122, were drilled at an azimuth of 10 degrees (LDH-122 was drilled at 4 degrees) and at a dip of -60 degrees. 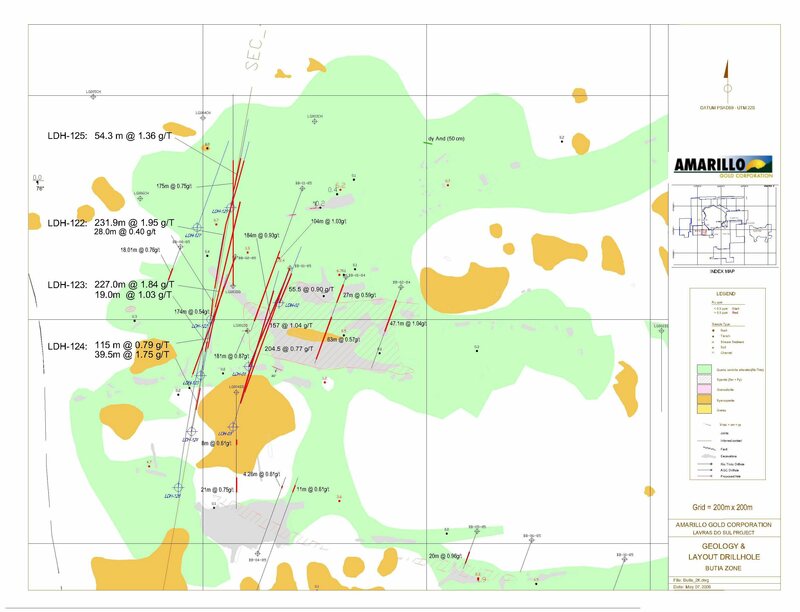 A map of the prospect and drill hole locations can be found either at the end of this release or at: http://www.amarillogold.com/sites/amarillogold.com/files/ButiaMap_May08.jpg. These higher grade intercepts appear to be hosted by an altered nepheline-syenite late stage intrusive to the surrounding perthitic granite, and although the granite is mineralized it is theorized that the silica under-saturated nature of the syenite acted as a better chemical/compositional trap to the mineralizing fluids. Current drilling at Butia is along the next section to the west and these holes also appear to intersected the same mineralized host. The syenite is open to the east, west and at depth. Other syenites have been mapped on the project and more attention will be paid to these occurrences in the future. Notes: All drill hole samples shown here consist of split HTW diamond drill core. The samples were sent to Acme Laboratories in Goiania, Brazil, and Vancouver, Canada. Gold is determined using fire assay using 50g aliquots with an ICP finish; if the grade is higher than 10 ppm a gravimetric method is used. All samples are subject to a chain of custody and are submitted with standards and blanks to check the assay results. The laboratories also use internal standards and repeat analysis. For the results reported in this release all the standards, blanks and repeats delivered acceptable results. To determine the reported intercepts, a 0.3g/t cut-off was employed with the constraint that no sub cut-off grade interval exceed 10m in length. There were 24 gold assays greater than 5 g/t Au in the reported assays for LDH-122 and LDH-123, and these are being repeated by Screen Fire Assay. While this technique may give substantially different results for particular samples, our experience is that the overall intersections will remain little changed. Amarillo Chief Executive Officer Buddy Doyle commented: "We are obviously pleased with this latest round of drill results. It is the first time that potential bulk tonnage intervals on the order of 2 grams per tonne of gold have been drilled at Lavras. 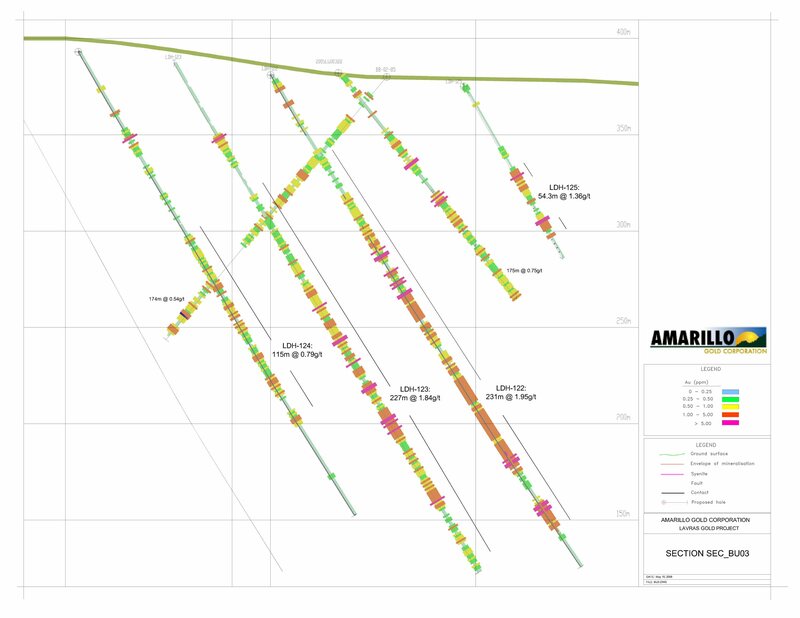 By happy coincidence, Amarillo has recently completed its 10,000th metre of drilling on the property, and I would like to congratulate our technical team on the ground, whose persistent and enthusiastic application of best exploration practices appears to be unlocking the gold mineralization potential within the Lavras intrusion." The Lavras granite complex hosts numerous areas of historic diggings and small mine workings that were the subject of gold rushes in the 1880's and 1930's. Gold mineralization had been drill confirmed in the 1980's at Cerrito and Butia, where it was found to be hosted in structurally controlled alteration zones with sericite and pyrite, +/- sheeted quartz veins. None of the other areas of workings and alteration, (which number greater than 12), have ever been drill tested prior to Amarillo optioning the project in 2006. Amarillo's strategy has been to systematically surface map these areas and follow-up, where warranted, with a drill program. Amarillo Gold Corp. is a company focused on the acquisition, definition and discovery of gold resources in Brazil. Its principal projects are the Mara Rosa project in the state of Goias and the Lavras do Sul project in the State of Rio Grande do Sul. The Posse Deposit at Mara Rosa was found by an independent 43-101 compliant preliminary economic assessment study carried out by CCIC to contain 1.18 million ounces (643,000 ounces indicated @ 1.48 g/t Au, 538,000 ounces inferred @ 1.26 g/t Au). The Company also has a portfolio of earlier stage projects. All properties under Amarillo's management are located in areas of good infrastructure and robust community support. The Qualified Person for this news release is Buddy Doyle as per the guidelines laid out in the NI 43-101. TSX Venture Exchange has not reviewed and does not accept responsibility for the adequacy or accuracy of this release. About this company Amarillo Gold Corp.